Construction to begin March 11. 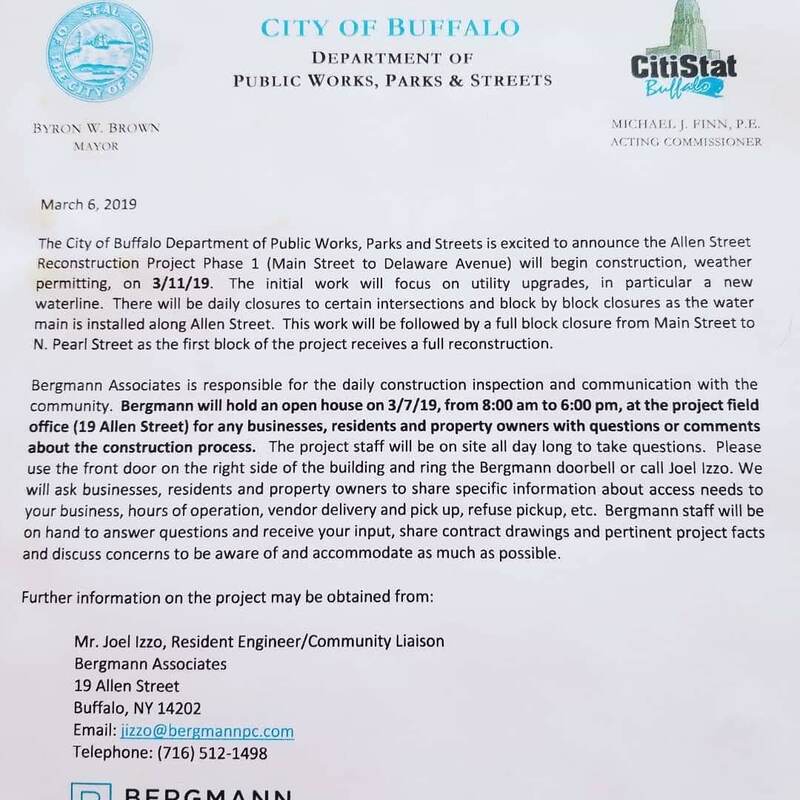 The City of Buffalo Department of Public Works, Parks and Streets is excited to announce that Allen Street Reconstruction Project Phase 1 (Main Street to Delaware Avenue) will begin construction, weather permitting, on MONDAY, MARCH 11, 2019. Initial work will focus on utility upgrades. There will be daily closures to certain intersections and block-by-block closures as the utilities are installed along Allen Street. Full block closure from Main Street to North Pearl Street will follow as full reconstruction continues. Bergmann Associates is the engineering firm responsible for the daily construction inspection and communication with the community. Bergmann Associates will hold an open house on THURSDAY, MARCH 7 from 8:00 AM to 6:00 PM, located at the project field office (19 Allen Street) for any businesses, residents and property owners with questions, comments or concerns about the construction process. The project staff will be on site all day long to take questions. Please use the front door on the right side of building and ring the Bergmann doorbell or call Joel Izzo (contact info below). Businesses, residents and property owners will be asked to share specific information about access needs to businesses, hours of operation, vendor delivery and pick-up, refuse pick-up, parking, one-way streets, etc. Bergmann will be available to answer questions, receive input, share contract drawings, discuss concerns and accommodations. The Allentown Association will continue to post updates on it's website, social media and email list.